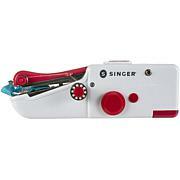 SINGER-Professional Series Scissors Heavy Duty. 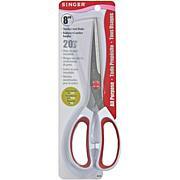 Exceptionally strong scissors for multi-layer fabric cutting. Razor sharp for effortless cutting. Tempered steel blades are ground on both sides for increased sharpness, longer life and smooth cutting. Comfort handle eases hand fatigue and ergonomic design for right and left handed use. 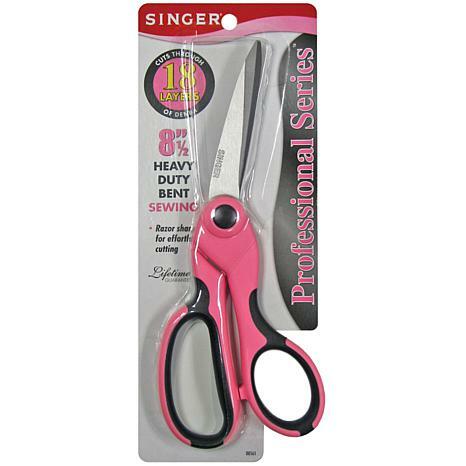 This package contains one 8-1/2in Bent Scissors that will cut through eighteen layers of denim with pink and black handles. Imported. I have some Gingher scissors that got nicked so I needed to replace them. I read reviews on these scissors and liked what I read, so I bought them. 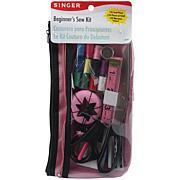 I have used them on 1 project so far and have been very pleased. They are lightweight and very sharp, even to the tip. The price is definitely right also. 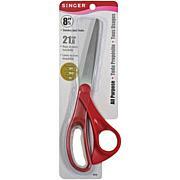 These a great heavy duty scissors.